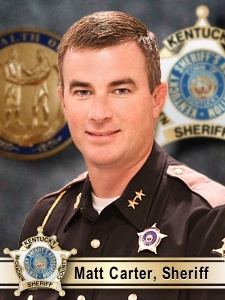 Sheriff Carter is a two time recipient of the Governor's Award for Outstanding Achievement In The Apprehension Of Impaired Drivers and the Fraternal Order of Police Outstanding Officer of the Year in 2006. Sheriff Carter is also active in the community. He is a member of Southland Baptist Temple and serves on its board of directors, finance team, and men's ministry board. Matt is a board member for CAST Ministries and has served in that capacity since 2012. Sheriff Carter's goal and vision is to lead the department to the next level of professional service. His desire is to make McCracken County a safer place to live and raise our families, while making it uncomfortable for the criminal element.